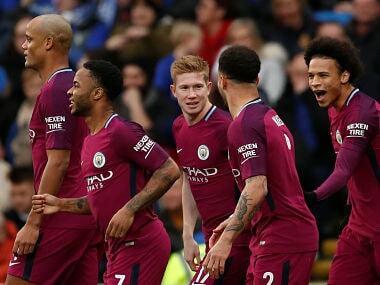 London: Kevin De Bruyne starred as Manchester City stayed on course for an unprecedented quadruple as a 2-0 win at Cardiff on Sunday put the runaway Premier League leaders into the last 16 of the FA Cup. City, 12 points clear at the summit of English football, are bidding to bring the Premier League, FA Cup, League Cup and Champions League titles to the Etihad. 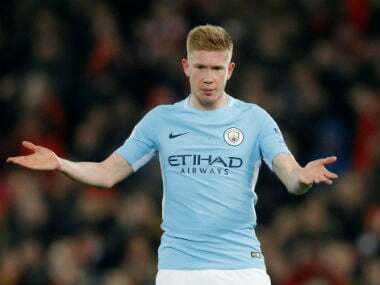 They made short work of second-tier Cardiff, with Belgian star De Bruyne putting them ahead in just eight minutes when he deceived the home side with a brilliant free-kick that he struck under, rather than over, the defensive wall. Bernardo Silva appeared to have doubled the City's lead with a thunderous 26th-minute shot but his goal was ruled out because the officials deemed Leroy Sane to be off-side and interfering with play. It appeared a harsh call but, with the controversial video assistant referee system that is being trialled in some English cup ties this season not in use for this match, there was no way of reviewing the decision. But the second goal Pep Guardiola's men had threatened arrived in the 37th minute when Silva's superb curling cross from the left was glanced in by Raheem Sterling. Sane was the victim of a bad tackle by Joe Bennett in first-half stoppage time and was replaced at the break by Sergio Aguero. Cardiff defender Bennett was sent off in injury time at the end of the match when he received a second yellow card for another poor challenge, on Brahim Diaz. De Bruyne said there had been nothing complicated regarding his goal, telling the BBC: "The wall was not nine metres away from me and so they were very close and it was easy to put it under." But he was slightly bemused by the tactics employed by a Cardiff side pushing for promotion to the Premier League. "They played man against man all over the pitch — it was a little bit weird," De Bruyne said. "It left a lot of space." Earlier, Michy Batshuayi scored twice as Chelsea beat Premier League rivals Newcastle 3-0 to also advance into the fifth round. Batshuayi's goals in the 31st and 44th minutes and a Marcos Alonso free-kick 18 minutes from time were enough for Premier League champions Chelsea to see off Rafael Benitez's struggling side. The Belgian striker's first was the result of a neat team move, Pedro's superb through ball splitting the Newcastle defence and leading to Eden Hazard slipping a pass inside to Alonso, who set up Batshuayi for a finish from eight yards out. The Belgian forward scored his second goal shortly before half-time when his shot took a huge deflection off Newcastle's Jamaal Lascelles. Alonso sealed the victory with a well-struck free-kick. "When I have a chance I take the chance and I work every day to be here," Batshuayi, who has been linked with a move away from Chelsea during the transfer window, told BT Sport. Following their League Cup semi-final loss to Arsenal, the FA Cup offers Chelsea their best chance of a domestic trophy this season. By contrast, Premier League survival is the priority for a Newcastle side that are currently just one point above the relegation zone. Newcastle manager Benitez when asked if he would be able to bring in a new striker before the transfer window shuts on Wednesday, replied: "I don't think so but we will see. We will try to do something." Benitez's former club Liverpool have also missed out on the last 16 after a 3-2 defeat by top-flight strugglers West Brom at Anfield on Saturday where Jay Rodriguez's two goals for the Baggies were overshadowed by several controversial VAR rulings. 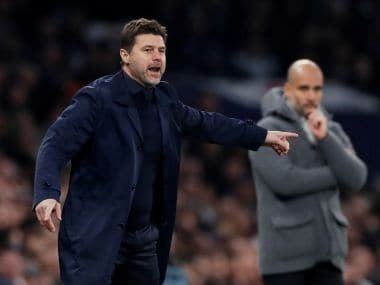 Tottenham Hotspur remain in the fifth-round draw, but only after an equaliser from Harry Kane eight minutes from time saw them to a 1-1 draw away to fourth-tier Newport on Saturday.